The day Amber Rudd knew for certain that her husband, the writer and restaurant critic A. A. Gill, was having an affair was when she went to pick him up from Heathrow. He had been on an assignment to Monte Carlo — and had no idea his wife would be there to meet him. She went because she was convinced he was cheating on her. When he emerged from arrivals, her worst fears were confirmed: he had a beautiful blonde on his arm. His companion was the South African-born model Nicola Formby, a journalist on Tatler magazine, who had accompanied Gill to Monte Carlo. There was no ugly scene after Rudd went up and surprised them. Despite her shock, she said nothing. Nor did Gill or Formby. Instead, in a scene straight from an Alan Ayckbourn play, Rudd calmly offered her husband and his mistress a lift back to London. The three of them then sat in the traffic with Rudd at the wheel, exchanging pleasantries as if nothing had happened. 'We were all in denial,' she says today, recalling that surreal car journey. 'I was suspicious he was having an affair,' she adds. 'I thought there might be more to the Monte Carlo trip than he had let on, so I decided to turn up unannounced at Heathrow to see for myself. When he came out with his girlfriend I knew it was true. 'He mumbled something feeble about them having been on the same assignment. It was obviously nonsense, but we all pretended nothing had happened. 'I didn't want to have a fight with her. She wasn't my enemy — I've never felt that. I've had a few laughs about it since then, but it was upsetting at the time,' she tells me in her Commons office with wry understatement. Rudd describes the airport incident today as the 'usual, sordid, catching-him thing' that so many betrayed wives have endured. It took place in 1995. She and Gill had two children: Flora, three, and Alasdair, one. 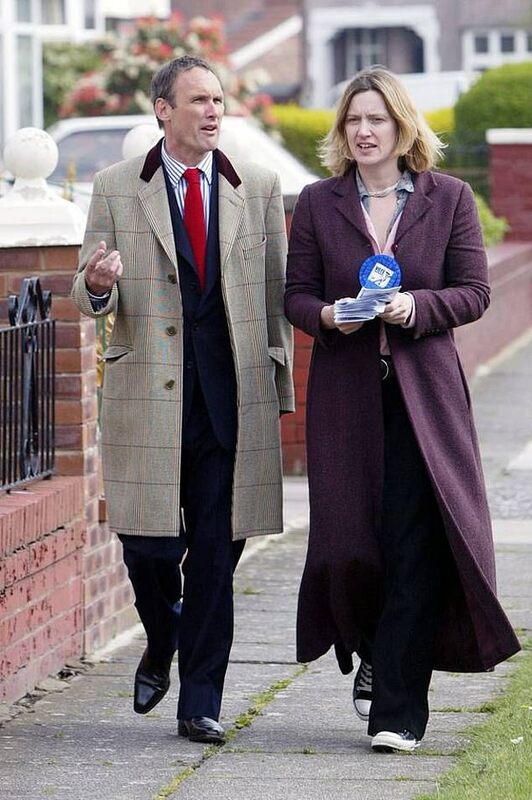 Gill left Rudd for Formby soon afterwards and went on to have two more children with her, remaining with her until his death from cancer aged 62 in 2016. This is the first time that Rudd has talked publicly about her marriage to the brilliant and acerbic writer who many have hailed as the most talented newspaper critic of his generation. She tells me that despite their separation, they were close again by the end. She says she also became good friends with Nicola — who Gill used to refer to in his newspaper columns as 'the blonde' — and that since his death, she and Nicola and their respective children had all 'mucked in' together, having found themselves united by a common love for him. Gill died shortly after Rudd succeeded Theresa May as Home Secretary, a promotion that led some to believe she might one day follow in Mrs May's shoes to No 10 as well. But then, five months ago, she was forced to resign over the Windrush immigration scandal in which British residents of Caribbean origin, who had every right to live here, had wrongly been declared illegal immigrants and deported. She was humiliated when her claim that there were no Home Office targets for deporting illegal immigrants proved untrue. Since her resignation, she has kept a low profile. But now, refreshed after the summer break, the former pupil of the blue-stocking private school Cheltenham Ladies' College is keen to re-enter the political fray. And she warns she has not given up hope of being Tory leader. Her admission comes in the week a secret memo that discussed potential Downing Street successors to Mrs May in the event of her being forced to leave office was circulated among Tory MPs. Amber Rudd is mentioned in the memo as a 'credible' contender 'notwithstanding Windrush'. The memo adds the caveat: 'But she is a Remainer.' It is a big 'but' with Britain's departure from the EU just six months away. Though, as we shall see, it is not a problem that deters her. 'Just because I campaigned for Remain doesn't mean my view on what Brexit we get is less relevant than Jacob Rees-Mogg's,' she says firmly. Indeed, she is remarkably plain‑spoken and determined when we meet, not only about Brexit and her aspirations for the future, but also about the very real possibility — and the perils — of a Corbyn government. And she is unusually candid about her relationship with Gill and how it started. Rudd was in her 20s and working at the investment bank JP Morgan. He was in his 30s and struggling to find his feet after battling alcoholism. 'I thought I could conquer the world. Everything was going well,' she remembers. Rudd casts her mind back to her mother's reaction to the news of her relationship with Gill, whom she went on to marry after she became pregnant with Flora. 'If my daughter came and said that to me I'd . . . ' She breaks off, but I get the drift. The marriage was 'wonderful to start with', says Rudd. But then her 'world absolutely fell apart when he fell in love with someone else and left'. That someone else was, of course, Nicola Formby. Rudd says that Gill 'always claimed he didn't fall out of love [with her], he just fell in love with someone else as well'. Perceiving my puzzled look, she shrugs: 'Yes, it was difficult to rationalise in my own head. Anyway, he left, and I was left with a one-year-old and three-year-old. She adds:'I was soooo devastated and found it difficult. As the mother of young children when the father leaves, you feel extraordinary guilt, which is irrational because it's not something you've done. But you can't help feeling when their father has left: what have you done to your children? 'He became a very good father to my children in their teenage years, but he was not a good husband — I think it's fair to say that.' Yet, she says, despite her heartbreak, Gill always remained 'respectful' to her and sent 'encouraging texts' as her political career took off. Rudd gives a moving account of the moment Gill phoned her and told he had cancer. 'So he waited another day and then told them. I just wanted them to have another day.' She says their children showed 'amazing' compassion in their father's final days. 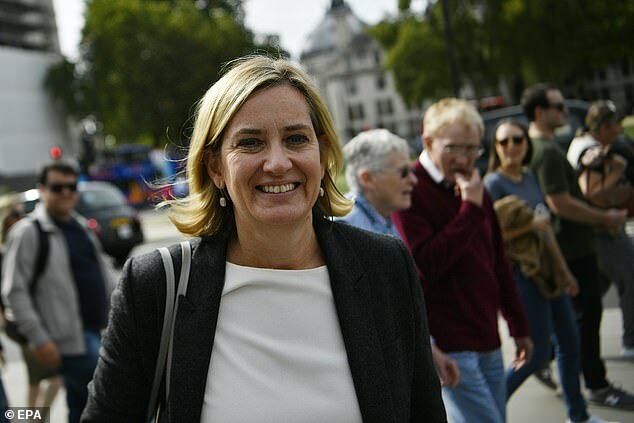 Rudd says she has never resented Formby, even though Gill, in his articles, regularly hinted at his infatuation with 'the blonde'; the writer Lynn Barber, who knew Gill well, remarked that he wrote 'many nauseating articles about her devastating beauty'. Today, Rudd and Ms Formby are 'good friends' — and have become closer since his death. To add to her difficulties, Rudd also lost her own father last year. Two days later, she stood in for Theresa May in a TV leadership debate for the General Election. Setbacks — whether personal or political, such as the Windrush affair — do not seem to stop her. Which explains why she is now itching to fully engage again in frontline politics. Nor is she put off by the fact that she only has a 346 majority in her Sussex constituency. As a Remainer, she feels ardently that she must become involved. 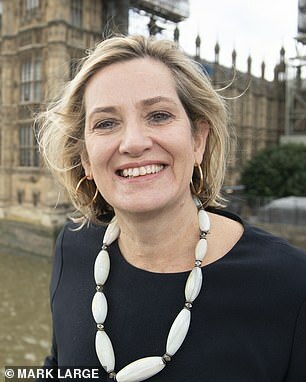 She believes some 'hard Brexiteers' are trying to use Britain's exit from the EU as an excuse to ditch many causes she holds dear, from curbing global warming to equal pay. 'Their purism is sucking the daylight out of everything and making the real danger — a Corbyn government — more likely,' she insists. The Windrush scandal and her anti-Brexit views have almost certainly killed off Rudd's dream of succeeding Mrs May. But she suggests she'd enter any leadership contest if only to take on her Brexit bogeyman Jacob Rees-Mogg over his hardline anti-abortion stance. 'I could never work with someone who is against a woman's right to have an abortion,' she says. Would she leave the Tory Party if Rees-Mogg ever became leader? Interestingly, she draws a clear distinction between Rees-Mogg and his Old Etonian fellow-Brexiteer Boris Johnson. Rudd once famously goaded the libidinous Johnson over his 'not-safe-in-taxis' reputation. But she stresses that she and Johnson are 'good friends', pointing out that unlike Rees-Mogg, the former Foreign Secretary is 'not socially illiberal'. For Puritanism is worse than promiscuity in Rudd's book. Perhaps she could be Boris's running-mate, I suggest. 'The other way round!' she flashes back.Rudd's on-off romance with another Old Etonian, Tory MP Kwasi Kwarteng, earned them a mention in last year's notorious 'Sexminster' dossier of MPs' love lives. They were listed as being in a 'workplace relationship'. Which brings us neatly to the BBC1 thriller, Bodyguard, in which Keeley Hawes plays a Home Secretary who is assassinated. Rudd is a fan — and not just because Hawes says she modelled her character on Rudd. When Rudd publicly praised the show, screenwriter Jed Mercurio light-heartedly offered her a cameo role in any follow-up series. With quickfire wit, she replied that she'd do it — but only if she was cast as the bodyguard.